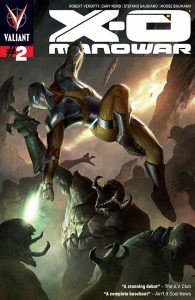 In X-O Manowar, we follow Aric of Dacia, heir to the Visigoth throne, as he’s taken captive by an alien race known as the Vine. Following his capture, he’s made to work as a slave and imprisoned. With Aric unhappy with his situation and wanting to get home, he starts planning a means of escape. We start the issue with a flashback to an intimate moment between Aric and his wife. Aric awakes, only to be forced to slave away in the gardens. After he disobeys his captors, Aric loses a hand. Cut to years later, where we find Aric and company still imprisoned, still slaving away, but they’ve been formulating a plan of sorts. Aric and his men stage a daring escape to what they believe is the armory, cutting their way through the guards. Once they reach their destination, the group finds only one suit of weaponry, the Armor of Shanhara, which Aric puts on. Once the guards burst in, and open fire, Aric returns fire and we see that Shanhara has chosen a human. First off, I just want to say that the cover is gorgeous, just beautiful. From the cover alone, people should want to pick this book up, which is the whole point of the cover. Jelena Kevic-Djurdjevic and Arturo Lozzi do a masterful job on the cover, and made the cover my favorite part of the whole comic. We finally get the climax we were wanting with the suit! I loved the slow take on the origin of Aric and everything, but it’s nice to finally see him with his suit. The buildup to it was great, but it’s nice to see him in action. A great, great ending for the second issue. The writing of the book is great as well. Robert Venditti does a wonderful job. Though not a well-known name like Hickman, Aaron, or Fraction, he writes much on the same level, and I wouldn’t be surprised if he goes on to write a big name book or two. You feel for the characters as they’re written. The pacing of the dialogue is wonderful, moving the story along at a steady pace, but not at one that you get lost in. You’re allowed to see the thoughts of the characters, and they’re written well. Overall, it’s just a great writing job. The art is amazing. Though not the most detailed of art, it conveys emotions so very well. You can see and sense how downtrodden and beaten these men are through the art. You can see the suffering on their faces, but also can see their defiance. The aliens also show good emotion, which one would think would be hard to do, convey emotions on a non-human face, but Cary Nord on pencils does it well. Along with inker Stefano Gaudiano and colorist Moose Baumann, Nord makes for a great issue art-wise. The colors are very good, especially in the shots out into space. Using outer space as a background is an interesting choice, and one that works well for the art of the pages that it’s used on. Overall, I’m glad to see X-O Manowar making a comeback. It’s showing a strong beginning, and hopefully will continue to be a great series. Definitely a series to pick up and be on the watch for.